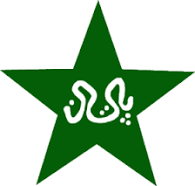 Pakistan cricket team is known as green shirts or SHAHEEN. it is represented by PAKISTAN CRICKET BOARD (PCB). it is fully member of ICC. Pakistan team known for its bowling attacks,it has played 823 ODI matches, wining 438 match out of them,tying 8 and 17 with no results. pakistan team won the world cup one time in 1992.this team gives a lot of good cricketers like vasim akaram ,imran khan, javed miyadad, shoyeb akhtar etc.